TORONTO — Washington State regulators have denied Hydro One Ltd.'s proposed takeover of Avista Corp., citing political interference in the Ontario utility by its largest shareholder — the provincial government. The Washington Utilities and Transportation Commission said late Wednesday that it found the $6.7-billion deal did not protect the U.S. company and its customers from political and financial risks. The U.S. regulator cited Premier Doug Ford's decision to remove the Hydro One CEO, which led to the resignation of the entire board, as evidence that the province was willing to put political interests above those of shareholders. Hydro One's 14-member board resigned after the sudden retirement of chief executive officer Mayo Schmidt, who Ford had labelled "the six-million-dollar man" for his hefty compensation. "Provincial government interference in Hydro One's affairs, the risk of which has been shown by events to be significant, could result in direct or indirect harm to Avista if it were acquired by Hydro One, as proposed," the U.S. regulator stated in its decision. It also said that the Ontario government's actions resulted in credit downgrades and decreased the value of Hydro One and Avista shares. "The province subsequently passed a law limiting the compensation of the company's executives and providing for ongoing involvement by the province in matters typically reserved to executive management and the board of a private company," it said. The commission concluded that Avista's customers "would be no better off with this transaction than they would be without it." Ford had made it clear that he wanted changes, including reduced electricity rates and lower compensation for the Hydro One CEO — even though 92 per cent of shareholders other than the province supported the company's executive compensation approach. 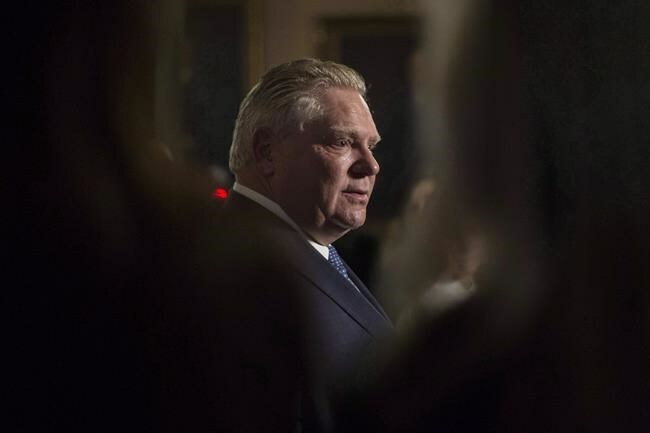 Getting rid of Schmidt and lowering hydro rates in the province were among Ford's main campaign promises during the spring provincial election that swept his the Progressive Conservatives to power. A spokeswoman for Energy Minister Greg Rickford defended the government's decision to make changes to Hydro One's executive. "Our government will always stand up for the largest shareholder of Hydro One, the people of Ontario," Sydney Stonier said in an email late Wednesday. "We are confident that the renewed leadership and direction at Hydro One will make responsible business decisions that are in the best interest of their shareholders." Stonier did not respond to questions about the failed merger, or what steps the government might take next. NDP Environment and Sustainability critic Ian Arthur slammed the Tories, saying the regulator's decision "makes it clear that Doug Ford's political meddling has sent shockwaves through the business community and increased the risk of doing business in Ontario." A number of analysts had predicted that the deal would fall through, saying the heightened potential for political interference could prompt U.S. regulators to hesitate about the takeover. Schmidt, who earned a $6.2-million salary last year, became a lightning rod for resentment during the election over rising electricity rates in the province. He retired in July, and the company said at the time he would not be entitled to severance, but would instead receive a $400,000 lump sum payment in lieu of all post-retirement benefits. He still stands to earn millions from deferred stock options.